My assumption is that the system has not changed significantly, and that party insiders will rise up again to crush Gingrich as they did back in December. And Lord knows they have the material to do it. Did they ever. It was ugly. It seemed like every Republican member of Congress who served with Gingrich took to the airwaves or the op/ed pages to pillory him. They even dug up Bob Dole to slap Newt around a bit. And it seems to have worked quite effectively. Now, what do I mean by "they"? I'm speaking of the party insiders, what some might call the "establishment." To understand this, it's important to read Jonathan Bernstein's post on the subject. 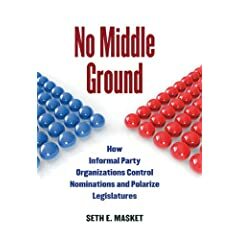 As he notes, the concept of the party "establishment" is not terribly useful, and it can be very difficult to distinguish between party "insiders" and "outsiders." I stick with the idea that the bulk of "insiders" (officeholders, major donors, activists, media figures, and others) are backing Romney and set out to crush Gingrich over the past week. But, of course, Gingrich did get the recent backing of Herman Cain, Rick Perry, and Sarah Palin, and I hesitate to call them (well, at least the latter two of them) "outsiders." Perry, despite being a rather pathetic campaigner on the national stage, is still the Republican governor of Texas, and Palin is, of course, the party's most recent vice presidential nominee. Similarly, how do we classify Gingrich? Sure, he's running as an "outsider," but as Ezra Klein notes, Gingrich is a rather odd person to claim outsider status, given his two decades in Congress, his four years as Speaker, his doctoral degree, his penchant for using Isaac Asimov books to generate policy ideas, and more than a decade of work as a DC consultant, party elder, and Sunday morning talk show mainstay. This is hardly the stuff of raw populism. But being an insider or an outsider isn't simply a function of one's résumé. He's running this way precisely because the bulk of insiders are already in Romney's camp. He has no choice. In The Party Decides, Cohen et al. talk about the importance of endorsements by out-of-group elites. The example they use is a vegetarian recommending a fish restaurant; if the vegetarian likes it, that sends a signal to people with lots of other preferences that the restaurant probably has a lot of good selections, even if their speciality is fish, and a whole group of people with diverse preferences may end up converging on that restaurant. Similarly, if, say, a prominent evangelical Christian backed Romney, that would be an important signal to other prominent party activists, and would probably be more impressive than if he got endorsements from other northeastern Mormon businessmen. The example we have today is that the bulk of Republican members of Congress who served with Gingrich are now backing Romney. It wouldn't be terribly impressive if they had backed Gingrich -- we'd have expected that kind of loyalty to the former Speaker. But the fact that they know him well and are refusing to back him is very meaningful. David Frum had one of my favorite quotes on the subject: "Suppose it were Gingrich v. Obama. And suppose we restricted franchise to Republicans who served in Congress 1978-1998. It'd be a close vote." Now, when party elites have converged on a candidate (as they have largely done in this case), it tends to be easy for the media to portray other rival candidates as flaky or eccentric, and the insider-backed candidate can exploit that. (Think Gary Hart '88, Howard Dean '04, Ron Paul in several cycles.) But with Gingrich, that's like shooting fish in a barrel. I had suggested a while back that this election was turning into a great test of The Party Decides, and so far it's looking like a resounding win for the theory. But Gingrich may have made it a bit easy for them. Now I can't stop picturing Karl Rove talking about pipe-hittin' Republicans. Thanks. If parties have become more interest group centered, how were GOP insiders able to crush the Gingrich insurgency?